All of the people in My Fascinating World of People are personalities I've met and have been photographed with. Today's column features some very unusual personalities. THE Sideshow is in town, and it has everything from the ugliest man in the world to the re-incarnated P. T. Barnum. The title of Ugliest Man in the World is something a lot of people vie for, but only one can win. To win the ugliest man title, one must be able to manipulate his face so that he looks much uglier than he actually is, and this is not an easy task. In past years a gentleman named Jack Webb held the ugliest man title that now belongs to Gail Sawyer. As I've said so many times, it was Confucius who said one pictures is worth 5,000 words featuring three of the men who are vying for the Ugliest Man title. The three men, Jack Webb, the former champion, Gail Sawyer with the high silk hat, and the man between them is this columnist. 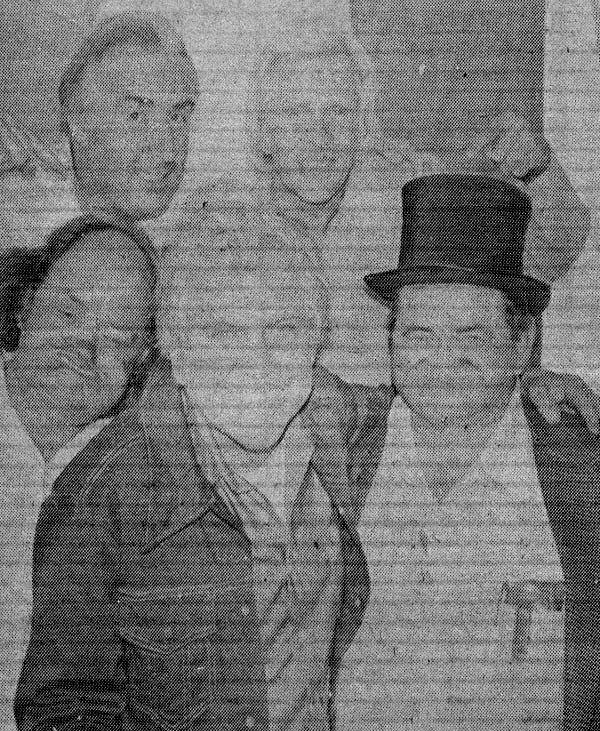 The handsome men standing in back, who were also judging the contest, are Sideshow Owner Jack Waller and Bobby Reynolds, the man many mystics claim is the re-incarnated P.T. Barnum. When the judging was over, Waller and Reynolds felt that all three of us were deserving an ugly title, and they finished it off in this manner. Knowing that Jack Webb is now involved with his own Show about the dangers of drugs, and being aware that i already have a job, they decided to stick with Gail Sawyer, and re-proclaim him the Ugliest man in the World. So it's with some envy and some pride that I bow to Gail Sawyer, the Royal Highness of the make-believe world of Ugliness, because, like beauty, ugliness is in the eyes of the beholder. SIDESHOWS were as a part of the circus as the big tent, and when the circus decline started, these sideshows were the first to go. The sideshows, like the circus, are making a spectacular comeback, and the one now appearing at the Sonoma-Marin Fair is something that no one should miss. This sideshow has all the flavor of the ones that brought us the Wild Man from Barneo, the smallest and tallest people in the world, and a number of others whose names belong in Ripley's Believe it or Not files. Jack Waller, proprietor of this sideshow, has gathered together what I think is one of the finest groups of sideshow people ever to appear under one tent. Bobby (P.T.) Barnum Reynolds (he's the re-incarnation) has more varied talents than Tom Thumb and Sammy Davis combined. Bobby Reynolds is also known as the Wizard, and that's why he's been put on the list of distinguished magicians who will attend the Harry Houdini S�ance in Count Dracula's Transylvania Castle. Among those you see at this sideshow are Volta, the Electric Girl, the Zig Zag Lady, the Human Volcano, the Man with the Iron Tongue, the snake charmer and the 1978 version of the world's ugliest man. THE SIDESHOW has played an important role in American history, and because of people like Jack Waller and Bobby Reynolds, new chapters are being recorded about the sideshow. Jack and Bobby have taken the traditional sideshow and added their own professional touch. These great, modern day showmen have proved that an ugly man can be as big and even bigger attraction than a handsome one. These two impressions have shown that sideshow showmanship is contagious and that people from all ages and all walks of life enjoy their type of entertainment as much today, as they did when the Ringling Brothers were competing with Barnum and Bailey. RIGHT this way to the carnival. Step right up folks and see what even Ripley wouldn't believe. This is the carnival, and the tent you're now approaching contains the sideshow, which has close ties with both the carnival and circus worlds. In the world of magic they say it's fun to be fooled. In the sideshow world, they give you the opportunity to try and distinguish the real from the illusion. The sideshow is really its own type of Alice in Wonderland, because it reflects the past - it is a mirror where the unusual appears - and it's the place where a man with an ugly face can become famous. Article submitted by Linda Casey (aka Mandy Lynn) One of �Jack�s Girls� June 17th 1978 Petaluma Calif.